and in fine stores carrying licensed University of Texas merchandise. 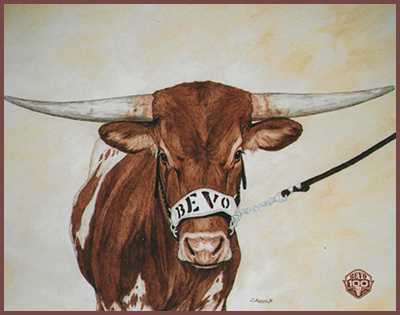 "Longhorn Proud" is the newest portrait of beloved Bevo XV, the University of Texas famous current longhorn mascot. 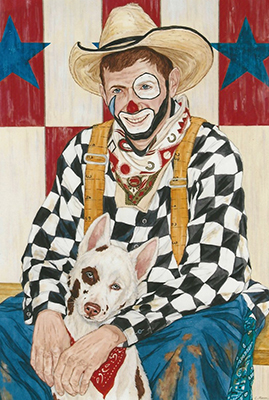 The detailed watercolor and gouache painting of three and half year old Bevo XV was done by Texas Ex, Cathy Sue Munson in association with the University of Texas Silver Spurs, which explains why one of the clouds behind this handsome steer is in the shape of a spur honoring both the legendary mascot and the outstanding student organization that has always cared for all of the fifteen longhorn mascots for over a hundred years. 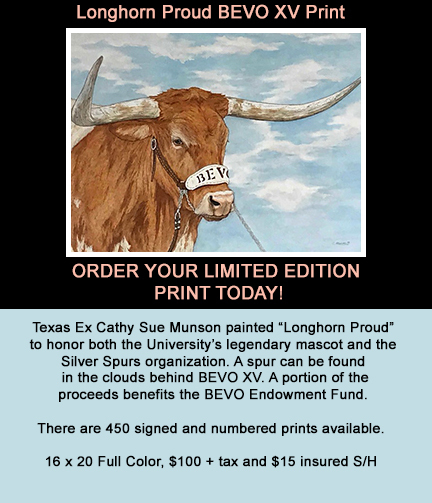 A portion of the proceeds of print sales will benefit the Silver Spurs Bevo Endowment Fund that provides for the champion mascot's care, lodging, and travel. 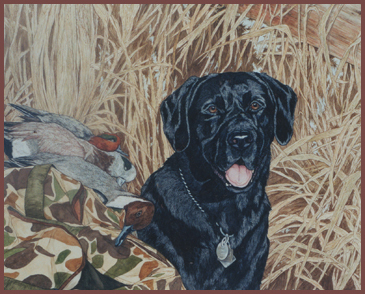 This most special collector's print is 16 x 20 in full color on archival acid free paper and signed and numbered by the artist. The print is an exclusive small edition of 450 and a must have collector's keepsake for loyal University of Texas fans. 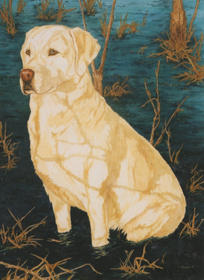 Each print is carefully inspected for color and accuracy by the artist, Cathy Sue Munson. are done from either your photos or Cathy's own. rickybrennes@utsilverspurs.com Place your order soon to receive a low number of the edition and HOOK EM HORNS! !